Attention Rockford! The Deadersons will be live at the Monster Bash/Zombie Prom! 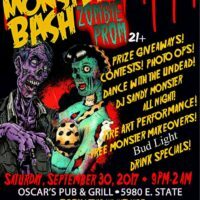 put on by the Trail of Screams and hosted by Oscar’s Pub & Grill this year on September 30th at 9pm. Come out and have a ghoulish good tie with us! !